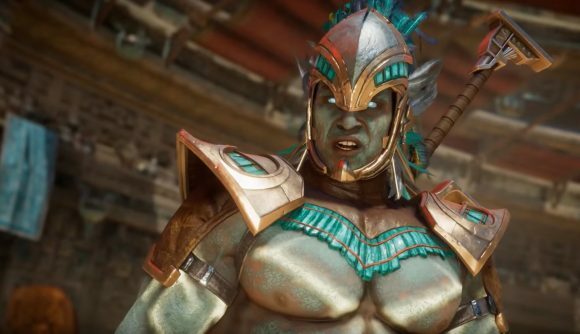 A brand new trailer from Mortal Kombat 11 introduces Kotal Kahn, the panther-transforming Emperor of Outworld, but his on-screen debut doesn’t necessarily show off his best side. The character trailer – which you can check out further down this article – lived up to Mortal Kombat 11’s usually action-packed displays of violence with Kotal Kahn Vs Jacqui Briggs. This fight was different from the usually dominant nature of a newly revealed character, however, as Jacqui Briggs brought the pain to the Osh-Tekk warrior and scored the fatality. After an impressive entrance from Kotal Kahn, Jacqui begins her assault with bone-breaking shots to Kotal’s face, with him quite literally sawing her in half with his sword in retaliation. To further increase the drama, Kotal transforms into a panther and removes vital parts of Jacqui’s internals using his teeth. Just when we think things are slipping into the usual MK11 style of character introduction, Jacqui delivers a shattering elbow to Kotal’s skull and shows of her impressive list of melee and ranged combos. Towards the end, Kotal’s last stand sees him chowing-down on Jacqui’s insides before repeatedly hammering her into the ground. Defying all the odds, Jacqui turns the fight in her favour using force-field technology, a rocket launcher, and pure determination. Scoring a victory over Kotal, Jacqui ends the fight with a fatality – boasting a surprise at the end. Kotal Kahn lost his MK11 debut, which was a surprising turn of events given the usual format of these trailers. That said, he may get his revenge when MK11 releases on April 23.